So I have obviously been talking about my daughter a lot lately. I am trying to find ways to write about this that aren’t simply “this is what is happening now, and now this, and now that.” I have also been thinking a lot about how to reflect on the good parts of her differences and give all the credit where credit is due to her amazing little mind. Tonight, while waiting for her to calm down and fall asleep I really thought about all of the things, good and bad, about autism that make her the individual that she is and how I can share that credit with the rest of the world. I came up with this post. I hope it enlightens and amuses. I hope that it provides strength to others who may feel exactly what I am feeling. And I hope everyone will grow to love Scarlett almost as much as I do. Once upon a time, but also as soon as about 30 minutes ago, there was a little girl named Scarlett. Sometimes, Scarlett gets very mad and spends at least 20 minutes, if not more, screaming. Biting, scratching, a colorful display. Unable to feel that she is thrashing around on the ground. Unable to understand that she may hit her head. Scarlett can’t grasp that it is taking every muscle in her mother’s body to apply the exact amount of pressure needed to keep her from getting hurt or hurting herself, while also trying to pick up all 60lbs of her. Sometimes it gets dangerous because suddenly seeing red blinds her and her foot hovers over the curb. Her mother’s heart stops beating until all 60lbs are in her arms. Her mother sees the little boy on the scooter standing quietly by the restaurant door waiting for his grandma to finish signing the check. Three little toddlers sit in a sandbox and hand each other pails and shovels or work on the same castle. A young girl holds her own mother’s hand and walks with her through the community garden. Her mother watches the little girl walking by, who can’t be much older than Scarlett, lean over to her father and ask why such a big girl is in a stroller. She sees the look on Scarlett’s face when she sees the overcrowded playground and the line for the ice cream truck and deep down knows that she just can’t do it right now. The day has already been too long and her mother can not set her up to fail. Sometimes any one of these things makes her mother cry. Scarlett likes to reach peak over stimulation from the day itself at about 9 o’clock at night. This is followed by a power nap from about midnight to 5am and then a period of fleeting calm during breakfast, as it is the only time of day that the house is silent (and the only time that they are both on their best behavior). Sometimes she will sleep through the night. And those quieter nights are the nights that her mother lies wide awake wondering how else she can keep fighting. Scarlett does have another side to her. A side far greater than the one above. The side the keeps her mother’s muscles tightened, her eyes glued, and her senses heightened. The side that shouts “DELIGHTFUL” over and over until you can’t even hear the tiny pangs of hardship anymore. Scarlett really likes textures. I bet not every mom gets to watch their three year old suddenly bend down and pull up blades of grass by the teeth and proclaim “Yummy!” before taking off down the street laughing almost maniacally. 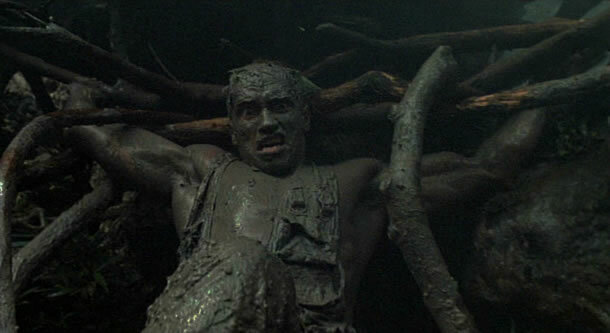 Not every mom turns around in the Dunkin Donuts drive thru to find their child shirtless and rubbing hidden and hoarded dirt on themselves like Arnold in Predator. Scarlett reacts to wearing clothes as though she doesn’t understand their necessity, writhing, sometimes in laughter, sometimes in tears. She loves to wear her wool hats, though. Just like her mother but even more so, as if it has taken a new meaning to her. She keeps several under her bed and can often be seen in nothing but a hat and a diaper trying to climb on the window sill to talk to the moon. She speaks in mimicked speech and television shows mainly, with the occasional request for a sugary food product in one or two words (“lollipop-p-p-p” or “cookie donut-t-t-t”) repeated over and over again. “I carry you.” This is often in a high pitched tone and has no relevance to anything that is happening, except on the stairs when her mother is carrying a few giant bags and a latte. “I hold you.” She pulls her mother to her as she is saying this, unknowing of her own strength and striking awe into her 180lb mother. “I kiss the booboo.” Her mother kisses it, no booboo present at all, because how can you not? “What do you think, Dr. Mommy?” This is often in a calm and collected tone, as her mother cringes down at a giant bloody scratch on her leg. Scarlett is also tolerant to pain, which while worrisome, also makes her mother feel like a total wimp in comparison. Scarlett lives in a world of celestial beings with hobbies, ducks and children that live together, snarky handbags, robots nurses that become superheroes, galaxies far far away, and talking lambs that wear tutus and obviously suffer from Munchausen syndrome because they are always at the damn doctor. The thing about this tale is that it doesn’t have an ending. This part can really go on and on and on and on because at the end of the day this is a celebration of individuality and embracing being the you that you are. Scarlett was crafted without the ability to fit into this masquerade ball we call society and that is really the best part of this entire story. Scarlett lives happily ever after, more so than most people on Earth. I am sure you give many people strength. I am one of them. As I read this I found myself trying to go deeper into my own mind. Like trying to find my own “Scarlett” For to think this way I would have to go deep into my self conscience. All I have to do to get there is to just read this blog and I will be teleported automatically. Sent to a place greater then this earth itself. Thank you for giving a glimpse into your and Scarlett’s life. She is lucky to have you as a mother. Thank you so much! It means the world to hear it!